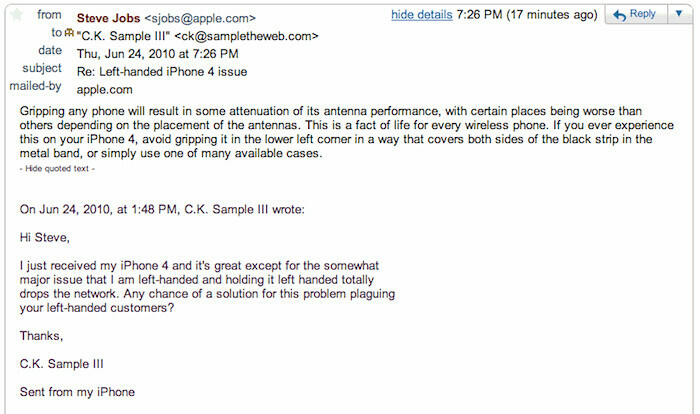 I received my iPhone 4 today and just as it arrived, I started seeing reports of the new antenna configuration not being so friendly to left-handed users. Being left-handed myself, I was concerned about this issue, so as soon as the epic job of restoring my iPhone 4 from my last iPhone 3GS backup finished, I tested it. Sure enough, as soon as I held the iPhone in my left hand like I normally do when I’m talking on the phone, the iPhone lost all connection to AT&T. Like dead, no signal useless. This is a huge problem in my opinion, so I did what I’ve been doing for the past several months whenever I hit a really odd roadblock with an Apple product. I sent Steve Jobs an email. Lots of people have been doing it for a while now. Steve has been responding. Both to them and to me. So far, I haven’t shared any of his replies to me publicly, other than to note on Twitter that he did respond. However, I think his response to my most recent email is both a rational level-headed response that gets to a real solution for avoiding this problem, and it’s clear at this point that Jobs somewhat expects his email replies to be broadcast, so I’m posting this one. Also, I should note, that I don’t really think Jobs’ rational level-headed response is entirely defensible. I’m not happy that I have to adjust to my iPhone in such a natural thing as the way I hold things up to the side of my head when I talk into them (whether they are cellphones, regular phones, or bananas). If hold it differently or get a case is really the only answer here, then it’s clearly bad design. Needless to say, based on Jobs’ reply, I’m skeptical of the theorizing that this is a software issue. UPDATE: Steve Jobs just emailed me the same exact email again… 30 minutes after the first one. Form letter that he’s broadcasting to all lefties in reply to emails similar to mine? Also, Steve Jobs or Steve Jobs’ assistant? This entry was posted in Apple, iPhone, Steve Jobs, Tech. Bookmark the permalink.